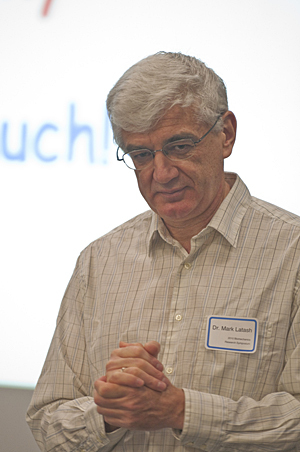 Penn State's Mark Latash addressed the Biomechanics Research Symposium. 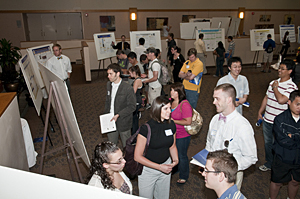 The symposium featured research posters. Richard Willy explains his poster. 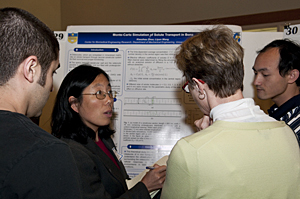 Liyun Wang discusses a poster. 1:18 p.m., May 10, 2010----Mark Latash is so fascinated by the concept of synergy that he has written an entire book on the use of the term in reference to biological systems. On Friday, May 7, he shared some of his most recent findings on the role played by synergies in the control and coordination of human movement at the 7th annual Biomechanics Research Symposium at the University of Delaware. The event was organized and hosted by UD's Center for Biomedical Engineering Research (CBER). Distinguished Professor of Kinesiology at Penn State University, Latash was the keynote speaker at the conference, which attracted more than 130 people from UD's biomechanics community. His talk, “Multi-Digit Synergies: Effects of Age and Fatigue,” addressed his development of a powerful new tool to study changes in coordination that accompany impaired performance with age, fatigue, and potentially other causes as well. Aging, he said, is associated with a shift in control from synergic, where the parts of the body work together, to somatotopic, where they are more like free agents. “In effect,” Latash said, “as we age, we become 'young' again, where our actions are more like the somewhat aimless movements of a baby. Latash's studies of fatigue have also turned up some surprising results. He carried out a study to determine what happens to multi-finger synergies when one finger gets tired. He likened the situation to four men carrying a heavy piano up several flights of stairs. If one of the four becomes tired and starts to wobble in his hold on the piano, he can be asked to step aside while the other three continue with the task, reducing the manpower by a fourth. However, in Latash's scenario, the other three can compensate with similar but complementary movements, enabling the task to continue with almost no loss in the quality of the performance. 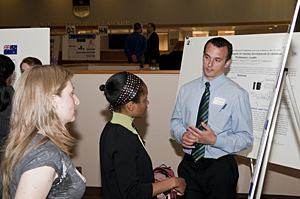 Attendees represented a broad array of disciplines at UD, including mechanical engineering, physical therapy, electrical engineering, biology, kinesiology and applied physiology, materials science, chemical engineering, and physics, as well as UD's Biomechanics and Movement Sciences (BIOMS) graduate program.